We are inching closer and closer to that four week mark of the season. Four weeks is generally a solid benchmark for data in terms of data being actionable going forward. We are currently working off of 2016 data and a 2017 two week sample, but we are getting close. That also means we are approaching the quarter mark of the 2017 season. It flies by and never feels long enough. Don’t blink or you’ll miss it. As with each week, there are things moving and shaking, evolving and changing. Our stats and resource pages are updated every Tuesday, and below are the pages I use to compile data for this weekly series. Let’s start with some running back observations, focusing particularly on snaps. •	Three bell cow backs appear to have been eased into action over the first two weeks. This makes sense for both Le’Veon Bell. After missing the entire offseason due to a franchise tag hold out, the Steelers have made a conscious effort to ease Bell into action, increasing from 71% of the team’s snaps in Week 2 up to 92% in Week 2. His usage increase was obvious when looking at the numbers. Bell had 16 opportunities (carries + targets) in Week 1 and nearly doubled that in Week 2 with 31. It is doubtful we see him on the field for less than 90% of the snaps going forward. He will dominate in the total touches category and has the chance to nearly double his 13 points from last week against the Chicago Bears in Week 3. •	Ezekiel Elliott saw an uptick in snap share as well and has already put together back-to-back weeks where he has increased field time compared to his rookie campaign where he ran 67% of the Dallas Cowboys’ total snaps. His five targets per game to kick off 2017 match both of his career-highs in targets from 2016. Last year’s rushing leader appears to already be more involved in this offense. •	Gurley’s total snaps may have been down from Week 1, however the Los Angeles Rams just ran less total offensive plays. His 14% team snap increase is what we should be looking at, rather than the four less total plays he ran. Gurley’s 48 points over the past two weeks are more than both Bell and Elliott combined (45). •	Missing from this chart is Jay Ajayi, who did not have a game in Week 1. There is not a running back in football who has been on the field for more of their teams’ snaps this season than Ajayi was in Week 2 for 94% of the Miami Dolphins’ snaps. He will be one of, if not the most, highest owned running back’s this week against the New York Jets who have allowed a league-high 41 points per game to running backs this season. 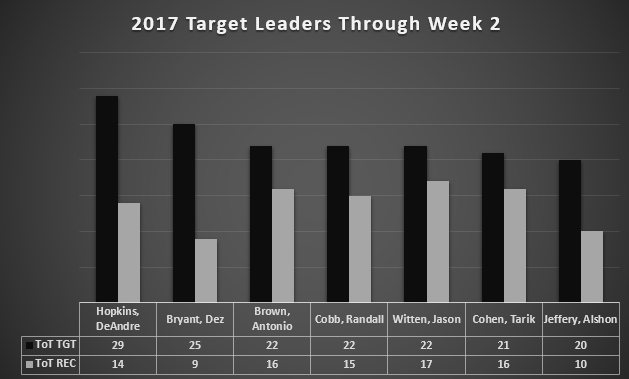 On to some target observations regarding 2017’s target leaders through Week 2. •	Bryant trails Hopkins by four targets with 25 total, second best in the league. His nine receptions put him at an unacceptable 36% completion rate. Things won’t get easier for Bryant this week when he will line up across from yet another shut down corner in Patrick Peterson. •	Bryant’s teammate Jason Witten leads the league with 17 receptions. At 35 years old he is more than paying off at his preseason ADP of TE14 and shows no signs of slowing down. Witten leads all tight ends with 22 targets, and no other tight end has cracked 20. •	Randall Cobb has Davante Adams’ owners in fits with his 22 targets through two games. The Green Back Packers have a match up this week against the Cincinnati Bengals, who could be without Adam Jones. •	Tarik Cohen has busted the one-week-wonder myth and leads all running backs with 21 targets. He is catching them at an efficient rate of 77% and has become the go-to player for Mike Glennon. The Bears may be in shambles, but as long as they are playing from behind Cohen will continue to see looks. The Chicago Bears are seven point home dogs against the Pittsburgh Steelers this weekend. Finally, some red zone and 10-zone, the most valuable target in the game, data. •	See above for Bryant and Witten. The targets are there for Bryant; the production should follow. If you are interested in acquiring Bryant, his schedule opens up a bit after this week. 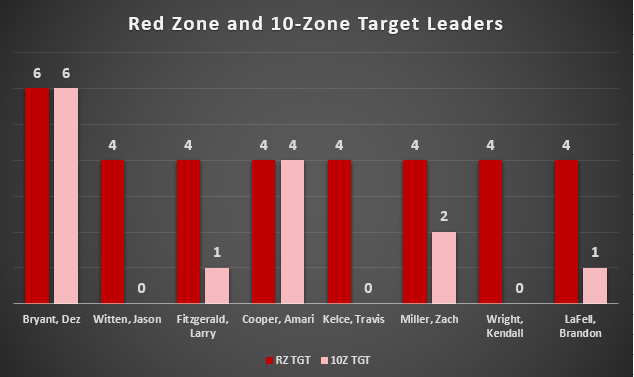 •	Larry Fitzgerald, Amari Cooper, Travis Kelce, Zach Miller, Kendall Wright, and Brandon LaFell all have four red zone targets. The dumpster fire that is the Chicago Bears is alive and well for fantasy purposes. •	Those four red zone targets for Brandon LaFell are concerning for A.J. Green owners. With Bill Lazor now coordinating in Cincinnati, we should expect major changes and one of those better be Green usage in the red zone. The Bengals travel to Lambeau Field this week to take on the Green Bay Packers. There should be plenty of throwing and scoring in this one where the Packers are nine point home favorites with a 44.5 point total. •	Michael Crabtree had three touchdowns in Week 2, but Amari Cooper is still being targeted in the red and 10-zone. He and Bryant are the only players who have seen all of their scoring targets come from goal-line situations. Cooper draws the Washington Redskins this weekend. Either Cooper or Crabtree will receive attention from Josh Norman and I expect the Raiders to move them both around. Those 10-zone targets are still encouraging and why you likely pay for him this weekend. Broken record effect, but each week when I pour over the stats I notice a few things that stick out for me. As always, I encourage you to do the same. All of our pages linked above provide a boat load of numbers for you to interpret and exploit. Good luck this week, and always feel free to reach out to me on Twitter @FFdeJENerate.